but I forgot to give her credit. Wait! Who am I again? "One could get a buzz off of this stuff!" There are some funky noises coming out of my Dell. And it's slow as molasses! bought me a netbook for my birthday. since we're not sure how much longer the Dell will last. 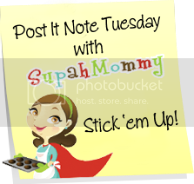 Now head on over to SupahMommy's blog to read some more good sticky notes! Go ahead, click the post-it! You know you want to! Happy Post It Note Tuesday!!! Lucky you on the Netbook. Enjoy. OOOH, Lost is coming back!! I'm behind though, so instead of watching it, I'll have to DVR it. I'm like, really, behind. Half a season behind. Oops. I did have a hard time reading these. I did get a bottle and a buzz, a cool birthday present. Lost is back love it.. Have a great Tuesday.. I have never watch Lost...*gasp* My mama calls every time it is on and tells me to watch it...I'll get it on netflix once I get caught up on True Blood. Oh and I AM WINNING SURVIVOR...ok...okay. My Dell is acting all slow lately too. I thought maybe I burned it out with all the blog reading. I'll Tell You What I Really Think!